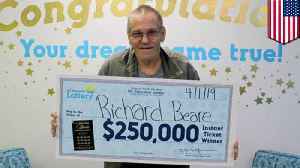 Darren Donaghey previously won a "Punching above your Weight" competition by marrying his beautiful bride and he's now hit the jackpot again. 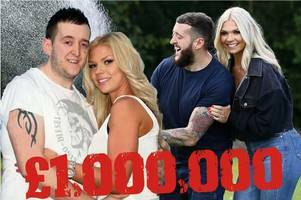 A man who won a "Punching above your Weight" competition by marrying his stunning bride has won £1 million on a scratchcard.Darren Donaghey, 33, and wife Kate, 28, will spend the money on their two children who have autism. 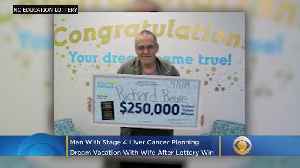 A North Carolina man who was recently diagnosed with stage four liver cancer is planning a dream vacation with his wife thanks to a $250,000 lottery prize. Gilma Avalos reports.